Ward Process, Inc. manufactures thermal insulation and combines barrier and acoustic absorber quilt panels for the Marine and Transportation Industries. 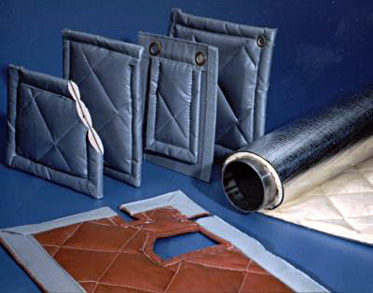 Insulwrap Quilts are a safe and durable form of thermal insulating acoustic treatment. HC-2.00QLT-GV-GV-25. 2in fiberglass quilted between two faces of tough vinyl-coated gray fiberglass-cloth. Other configurations available. WM2X-16-1.00QLT-GV-GV-25, X=1.00QLT. 1lb barrier sandwiched between two layers of 1in fiberglass, quilted to front and back facings of tough vinyl-coated gray fiberglass-cloth.